In addition to the debugging tools available in the Debugging tab, the Multirate diagram includes a Debug palette for debugging a Multirate diagram. You can use probe nodes to visualize data and debug code directly on the diagram. Because the Multirate diagram has no panel, probe nodes provide the most direct method of visualizing data. Probe nodes appear and behave differently than standard debugging probes. The following table describes the two probe nodes available in the Debug palette category. Numeric Probe Displays the last numeric value that a simulated Multirate diagram processes. Use Numeric Probe nodes when you want to view only a single data value, such as when you want to verify the result of an operation or equation. Graph Probe Displays a graph of the simulated data that a Multirate diagram processes. The graph retains up to the number of data samples you specify in the History Size setting that appears on the Item tab when you select the Graph Probe. The Graph Probe includes a toolbar to the right of the graph to help you read graph data. 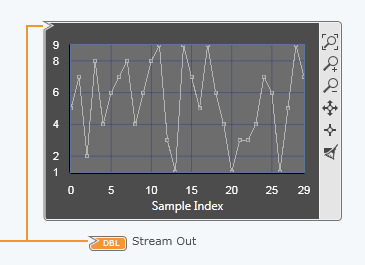 Use a Graph Probe when you want to view a stream of data values, such as when you want to view stream values or verify the result of operations that take place over multiple diagram iterations.